Those of us already with children remember those first few days/weeks home from the hospital.... the amazing excitement at this new incredible miracle (that they actually let you take home... BY YOURSELF!! ), and also the crazy feelings of being tired, sore, emotional and overall just overwhelmed with this new way of life. In those first weeks of trying to establish some semblance of a "routine", there is usually nothing more appreciated than the kindness of a friend dropping off a home-cooked (or even store-bought!) meal, a thoughtfully chosen gift for baby or mom, or even just a quick visit and the chance to let someone else hold the little one while you take a moment for yourself. I was blessed with an amazing sister-in-law who coordinated a bunch of meals for our family when my daughter was born. The kindness of those ladies meant so much to me and made the transition much easier. Want to bless someone in your life with a bit of new mama love? Here's a few tips to keep in mind! If someone is not coordinating meals for the family, make sure to call mom or dad ahead of time to coordinate what day would work best for them, and to see if they have already received meals, so you're not duplicating and bringing them their fourth lasagna of the week! Find out if the family has any food allergies. Though your enchiladas are to die for, that won't matter if mom's allergic to cheese! If possible, bring a complete meal... protein, starch and a veggie. Dessert is bonus! This completely takes any prep work out of the hands of the new mom (or dad!) and doesn't leave them to have to supplement your main course. Bring a meal that can be stretched into several meals with leftovers, such as a casserole, or whole chicken, and something that re-heats well. Meals that can be refrigerated or frozen are also great, in case for some reason the meal is not able to be eaten that night. If possible, provide meals in disposable containers and dishes, so the new parents aren't left with a stack of Pyrex dishes to return. Label food with the contents, date and heating instructions if necessary. Not a cook? No problem! Find out the couple's favorite take-out spot and menu items for a fun surprise. Or, try one of the meal assembly centers such as Dream Dinners to provide delicious freezable meals to be eaten whenever is convenient for them! Even better, give a creative and thoughtful baby shower gift of a Dream Dinners session and let mom and dad stock up even before baby's born! Just last night I was able to drop off meals to both my wonderful sister-in-law and another family friend who recently had babies. This time it was one of my favorites, homemade Mac & Cheese, Martha's to be exact. It makes a HUGE portion, reheats well and is just plain delicious. Enjoy it for yourself, or pass it along to a new mom YOU know! 1. Preheat oven to 375°F. Butter a 3-quart casserole dish; set aside. Place the bread in a medium bowl. In a small saucepan over medium heat, melt 2 tablespoons butter. Pour the melted butter into the bowl with the bread, and toss. Set the breadcrumbs aside. 2. Warm the milk in a medium saucepan over medium heat. Melt the remaining 6 tablespoons butter in a high-sided skillet over medium heat. When the butter bubbles, add the flour. Cook, stirring, 1 minute. 4. Remove the pan from the heat. Stir in salt, nutmeg, black pepper, cayenne pepper, 3 cups cheddar cheese, and 1 1/2 cups Gruyère (or 1 cup Pecorino Romano); set the cheese sauce aside. 5. Cover a large pot of salted water, and bring to a boil. Cook the macaroni until the outside of pasta is cooked and the inside is underdone, 2 to 3 minutes. Transfer the macaroni to a colander, rinse under cold running water, and drain well. Stir the macaroni into the reserved cheese sauce. 6. Pour the mixture into the prepared dish. 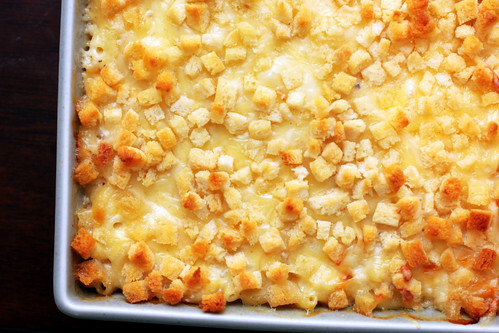 Sprinkle the remaining 1 1/2 cups cheddar cheese, 1/2 cup Gruyère (or 1/4 cup Pecorino Romano), and the breadcrumbs over the top. Bake until golden brown, about 30 minutes. Transfer the dish to a wire rack for 5 minutes; serve. I can't wait to try this recipe. I've been looking for the perfect mac and cheese recipe forever (My mom's is the best but try as I may, I just can't seem to replicate it!). Good post!